For Softail Models: Will not fit Rockers. 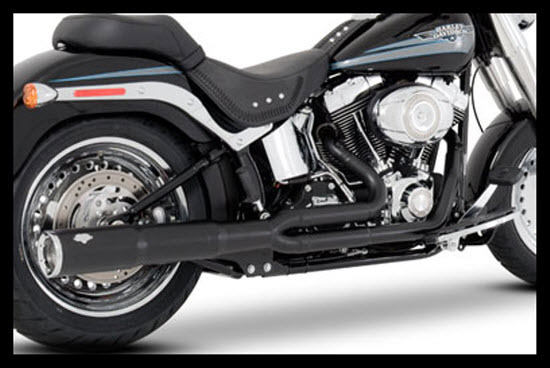 Pro Pipe Hi-Output is a purpose-built addition to the Pro Pipe family of 2-into-1 exhaust systems. Every aspect of Pro Pipe Hi-Output’s design is singularly focused to yield maximum horsepower by improving the volumetric efficiency of heavily modified engines. After countless dyno tests Pro Pipe Hi-Output was built utilizing tuned length headers that step from 1-3/4” to 2-1/4” to optimize exhaust gas velocity and scavenging while also maintaining the perfect balance of exhaust back pressure, assuring crisp throttle response and maximum roll on power. In addition, the merge collector features handcrafted internal knife edging to further improve scavenging efficiency through the collector. Following the collector, the megaphone immediately tapers out to a 3-1/2” muffler body that expands to 4 1/2” for increased baffle area. Our exclusive Vance & Hines baffle features reverse cone engineering that allows maximum power yet omits the perfect exhaust note rumble for any hi output motor. Keeping its focus on performance, Pro Pipe Hi-Output retains the signature cues of the Vance & Hines Black Line with its high temperature ceramic coating and contrasted machined billet end cap. Don’t waste your time trying to find an exhaust system that makes more power...there isn’t one.